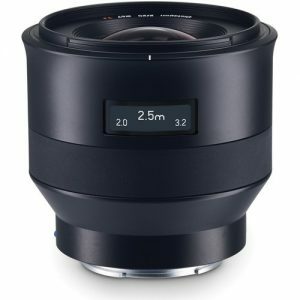 The Zeiss Batis 25mm f/2 Lens is a prime, wide-length lens that covers full frame sensors on cameras like the Sony A7s II, and mounts on any Sony camera with an E mount. Its fast f/2 aperture makes it great indoors, and where you want maximum control over depth of field. The T* coating minimizes reflections and glare. This lens is exceptionally sharp, even wide open. The autofocus makes it a natural choice for still photography, landscape photography, events, and documentary work. The digital readout highlights the focus distance and depth of field range. The lens has auto and manual focus modes, and iris is controlled electronically. It has 67mm front threads.